The river valleys are in the North Sea, north of Scotland, beneath a kilometre of water and a further 2 kilometres of sediment. The sea floor here has been slowly sinking ever since it formed. Yet 55 million years ago, something very strange happened. In a geological blink of an eye the sea floor was thrust upwards nearly a kilometre, until it was high and dry above the waves. It remained above the sea for about a million years, long enough for rainwater to carve deep valleys. Then it sank down again. It all happened astonishingly fast. The big question is why. None of the usual explanations apply. The collision of tectonic plates can lift vast regions many kilometres up into the air, but there are no colliding plates under the North Sea. Sea level can fall when huge ice sheets form, but not by a kilometre and not in only one area. Volcanic hotspots, where hot molten rock rises up from deep within the Earth, can also produce uplift, but the nearest hotspot is hundreds of kilometres to the west, where it has lifted up Iceland. What's more, hotspots produce slow uplift over tens of millions of years, not a relatively sudden rise and fall. The North Sea is not the only example of a geological jack-in-the-box. Something similar seems to have happened in several regions around the world, including the coast of Angola and the Arabian peninsula. In fact, there are many long-standing geological mysteries of this nature. Now, at long last, there may be an answer. A team from the University of Cambridge reckons that the likely culprits are pulses of particularly hot rock or, to give them their highly technical name, "hot blobs". These blobs are less dense than the cooler material around them, so when they pop up under the crust they temporarily lift large areas up in the air. In some cases, they appear to spread out in a gradually subsiding circular ripple. (Check out ouranimated graphic to see how it works). What's more, in many places there may have been a series of pulses, lifting and dropping the land over and over again. And while hot blobs are most likely to occur at or near major hotspots, the Cambridge team says, they could pop up almost anywhere. If the idea is correct, it could solve a lot of irritating riddles in geology. Maybe even one of the biggest of all: what triggered one of the hottest periods in Earth's history. That idea that hot blobs exist in the mantle, the region between Earth's crust and its core, is not new. It has long been known that some parts of the Earth's mantle are hotter than others. In fact, one of the few things known for sure about the mantle is that its temperature, viscosity and density vary widely. This keeps the mantle constantly churning, as hotter and less dense rock rises towards the crust while cooler and denser slabs sink towards the core. This mantle convection is what powers the movement in plate tectonics, and brings heat to volcanoes and to hotspots such as the plumes beneath Hawaii and Iceland. It is also well known that within hotspots, blobs of particularly hot rock occasionally rise up. Models of the Earth's mantle have suggested that they exist, and there is also solid evidence in the form of changes in the types of volcanic rocks found on the ocean floor. Until recently, however, nobody imagined that these hot pulses could change the Earth's surface dramatically and quickly, or that this could happen away from major hotspots. The best evidence to support the Cambridge team's claims comes from two areas north of Scotland. By setting off modest explosions and analysing the echoes, it is possible to create detailed three-dimensional maps of what lies beneath the sea floor. Seismic images from the oil industry have revealed ancient land surfaces, now buried beneath 2 kilometres of sediment, with the unmistakable pattern of river valleys. A new, more detailed map is due to be published soon by the Cambridge team. The seismic evidence is supported by borehole samples. The deepest cores, representing the oldest rocks, contain large numbers of marine fossils. Higher up, and so more recently, coal deposits and pollen suddenly start appearing, along with signs of rivers. Then, a million years later, marine fossils start appearing again. What this shows is that about 55 million years ago, the sea floor was much closer to the surface, and was subsiding very slowly. Then, abruptly, an area halfway between Scotland and the Faroe Islands was lifted by at least 800 metres over the course of a million years. Over another million or so years, it sank again. There is also evidence that another area several hundred kilometres to the east also briefly popped up before sinking back beneath the waves. Afterwards, the slow subsidence of the sea floor resumed, so this old land is now 3 kilometres down. "Something happened to make a happy marine environment go up by at least 800 metres," says Nicky White, who leads the Cambridge team. That something, the team suggests, was a hot blob coming up the Iceland plume, a few hundred kilometres to the west, hitting the tectonic plate and spreading out like a ripple beneath the North Atlantic at the rate of 40 centimetres per year (Earth and Planetary Science Letters, vol 267, p 146). 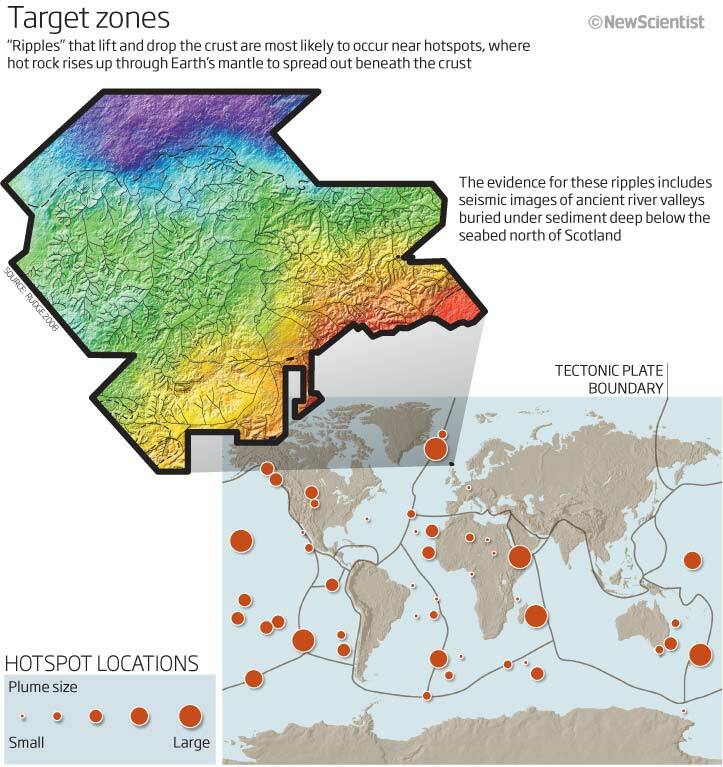 As the hot ripple spread out it pushed up the land above it, since the lower-density hotter rock took up more space in the mantle than the surrounding rock. Then, as the ripple spread out further, the land behind it was dropped. Lovell likens the effect to rats running under the carpet. Something similar would have happened all around the ripple and Lovell says there is evidence for a similar uplift on the opposite side of the posited circle, in Greenland. Animated graphic: "Ups and downs"
As if this weren't dramatic enough, newer and as yet unpublished seismic maps have revealed even older land surfaces even deeper beneath the seabed in the same area off Scotland. That suggests that this process did not just happen once, 55 million years ago, but several times. "There is a whole series of these landscapes on top of each other," says White. "Every 2 to 5 million years you get rats under the carpet." Modelling of a virtual hot blob pulsing up the Iceland plume has convinced the team that, for Scotland at least, the ripple theory stands up. And there are tantalising hints of "rats under carpets" elsewhere. On the coast of Angola in western Africa, for example, a dome 1000 kilometres in diameter was lifted 500 metres in the space of just a couple of million years, starting 5 million years ago. Seismic imaging suggests that there is something particularly hot in the mantle underneath it, says White, so perhaps this hot region pulsed even hotter 5 million years ago. There is also unexplained uplift in the Arabian peninsula that looks a lot like the work of a hot blob, says Lovell. White and Lovell admit they need more evidence to be sure that hot blobs are at work beyond the North Sea, but say that they are expecting to find more signs of the effect all over the world. Clint Conrad, a geologist at the University of Hawaii in Honolulu, is intrigued. "The idea that we can get uplift in areas distant from the regions of volcanism is fairly new and indicates that whatever is going on is an aspect of either plumes or mantle flow that we don't completely understand yet." But he thinks that hot blobs will only show these kinds of dramatic effects where there is already a decent-sized hotspot (see map). Scotland isn't that far from Iceland, he points out, so it is where you would expect to find such an effect if it exists. The Cambridge team, however, thinks there is no reason that hot pulses couldn't create dramatic - and transient - uplifts almost anywhere, though White advises caution: "We can't invoke blobs everywhere." If this is right, geologists may have to reassess some long-held assumptions. They have long tried to explain mysterious changes in coastlines by attributing them to global sea-level change due to some unknown ice age, and then used these putative events to date landscapes. A bigger implication, though, is Lovell's suggestion that the Scottish hot blob helped trigger an abrupt warming known as the Palaeocene-Eocene thermal maximum. Around 55 million years ago, when Earth was much hotter than today, global temperatures suddenly shot up by 6 °C to 10 °C, causing a minor extinction event. The evidence points to a rise in methane levels, most likely from methane hydrates on the sea floor. This release could have been triggered simply by a rise in ocean temperatures, but uplift of the seabed would also destabilise any methane hydrate deposits. "What we know is that right at the same time this hot blob passed under the North Atlantic, there was a major release of carbon into the atmosphere," Lovell says. "We're not allowed to appeal to coincidences in science, but it's got to be a good candidate." Computer modelling by two other members of the Cambridge team, John Maclennan and Stephen Jones, has suggested that up to 2000 gigatonnes of carbon might have been released in such a way. "A large methane release of even a few per cent of that figure would be enough to trigger catastrophic climate change," says Euan Nisbet, an earth scientist at Royal Holloway University of London, who has proposed an alternative source for the methane. We are a group of volunteers and starting a brand new scheme in our community. Your web site offered us with helpful information to paintings on. You have done an impressive process and our whole community can be thankful to you.